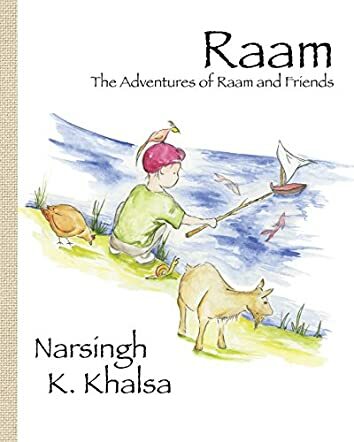 Raam by Narsingh K Khalsa is a charming story that follows a little Sikh boy and his adventures in the outdoors as he plays and has fun. Raam has a passion for exploring nature and discovering new knowledge around him. This is a beautifully illustrated picture book which is perfect for under five-year-olds. The tale is simple but unique as it shows the world through the eyes of a Sikh child as he plays in the countryside. Raam is fascinated by the plants and animals around him and, after a long day, he falls asleep, dreaming of his adventures. Raam's childhood experiences are told plainly and can be easily appreciated by all young readers as they learn about other faiths and the similarities they share. The book ends with an explanation of the background of the Sikh religion and their core beliefs, as well as an illustration of how to create your own turban. Raam by Narsingh K Khalsa is the perfect bedtime read for any young child. It is lovely to read a story that is exceptionally well written and sympathetically told through the eyes of a little Sikh boy. The artwork throughout is amazing and relates perfectly to the story. I found the step by step guide to creating a turban wonderful. It is so important for children of other faiths to learn about world religions. I think the concept of a story through the eyes of a young Sikh boy is an excellent idea so that children of the Sikh faith can have a book entirely devoted to them. This would make a wonderful addition to any school library.